The new BioShock looked a little too much like the old BioShock for Irrational's liking. Irrational Games says that BioShock Infinite's distinctive, early 20th century look didn't just spring fully formed from its collective mind; the studio went down a different path at first and actually had to make some pretty significant changes to give the game its own identity. Irrational's creative director Ken Levine said that at one point, the game was essentially the original BioShock, but in the sky rather than under the sea. Art director Nate Wells said that once the studio had realized that it was treading rather familiar ground, it resolved to make some aggressive changes to the game's look. "Ken started literally pushing back the clouds - 'bluer, bluer!'" said lead artist Shawn Robertson. "We were really uncomfortable with it, our initial reaction [was] 'it's a little bit cartoonish' ... but when we saw it in context, that was our a-ha moment." Robertson said that the time that Irrational spent "getting it wrong" had proven invaluable, as he didn't think the studio would have found its way otherwise. "You need that galvanizing idea," he said. "But you can't ... just 'do nothing' until you have it." 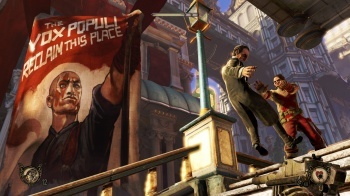 BioShock Infinite comes out for PC, PS3, and Xbox 360 in 2012.